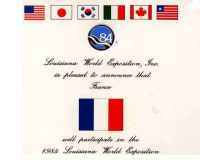 Fifteen years ago this month the Louisiana World Exposition, our 1984 World's Fair, was the Crescent City's main event. Though a financial disappointment, the Fair was an artistic and entertainment success--and a big hit among local citizens and visitors alike. 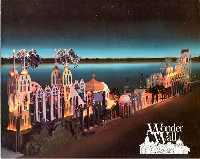 Live performances at the jazz tent and the wonderful amphitheater on the River, the monorail and the aerial rapid transit ride across the Mississippi, the nightly fireworks displays, and a wide variety of educational exhibits all made the Expo an ex citing venue. 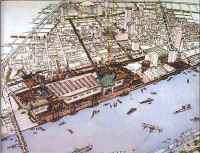 Above all, the Fair brought the Riverfront into use as a destination for tourists as well as for New Orleanians, many of whom had never before experienced it up close. We take the opportunity of this anniversary year to revisit the LWE through a small selection of photographs, souvenirs, and documents dealing with the planning and celebration of our splendid World's Fair. Look for a full-blown exhibit to commemorate the Expo's quarter-century birthday in the year 2009!